Mardi Gras is February 13th this year and I got a nice treat from Community coffee. 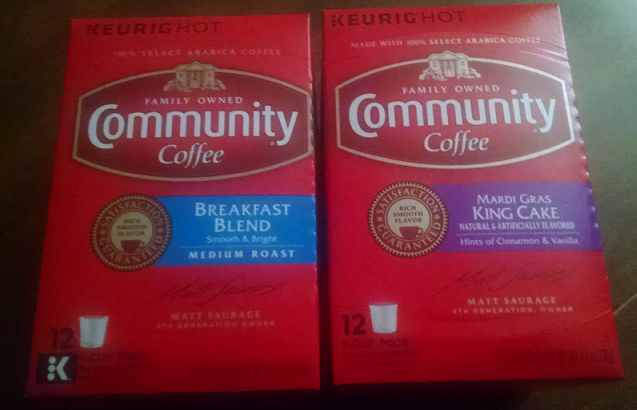 I received their Carnival Cake Coffee and Breakfast Blend single serve (k-cups) for this review. If you’ve never been to New Orleans or the surrounding parishes for Mardi Gras, you’ve got to put it on your bucket list! It’s a lot of fun when it’s not freezing or raining. As you may know being from New Orleans, anything having to do with King (Carnival) cakes are very much a tradition this time of year. Community® Carnival Cake coffee can be found starting around December on the shelves in your local supermarket throughout Southeastern U.S. markets such as Baton Rouge, Alexandria, Lake Charles, Lafayette, New Orleans and surrounding areas, Houma, Memphis, Birmingham, Jackson, Mobile, Houston, Shreveport, Tyler, Monroe, Little Rock, Austin and Dallas. It is also available in HEB and Dierberg stores, as well as online at CommunityCoffee.com. It’s for a limited time so make sure that you stock up on your 12-ounce bags and single-serve K-Cup® pods. Community Coffee Breakfast blend is an aromatic, medium roast that is sure to awaken your senses and follow with a smooth finish. Made from only the top 10% of the world’s coffee beans. While the coffee was brewing, the smell was heavenly. My first cup was delicious and smooth. There wasn’t any harsh after taste. I drink this coffee on those mornings I just don’t feel like I can wake up and it helps! Step 1. BUY 4 – Buy your favorite Military Match Set of four 12 oz., 16 oz., or Single-Serve 18 ct. coffees. Step 2:GET 4 FREE – Community coffee will match your purchase with additional four items, and send all eight items to the APO/FPO or military base address you provide. Step 3: A FREE MUG! – They’ll even include a Signature Military Mug with your shipment. 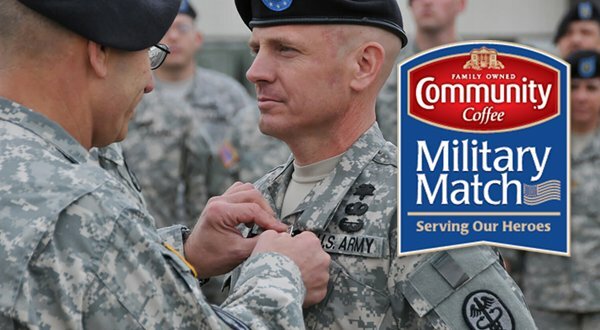 To learn more about the Community Coffee Military Match program, visit their website at CommunityCoffee.com/militarymatch. Be sure to check out our other Product Reviews Reviews.